British National Football League (NFL) stars Melenik Watson and Lawrence Okoye spoke of their paths into American football whilst at a fan event in London recently. 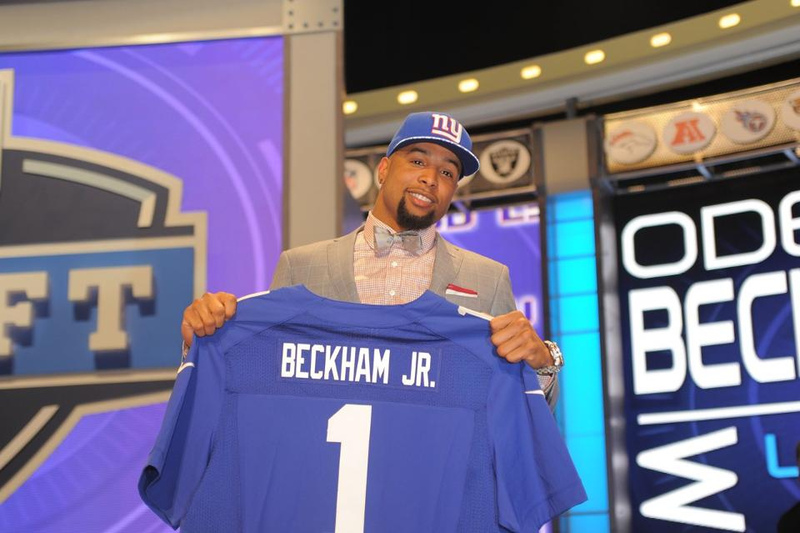 Joined by rookie sensation Odell Beckham Jr, the pairing opened up about the moment they knew that their futures lay on the gridiron. Watson, born and raised in Manchester, told the audience about his switch from basketball to American football, which lead him to becoming the highest drafted British player of all time by the Oakland Raiders. “The moment I knew I wanted to go to the NFL was when I quit basketball. I’d never quit anything in my life and basketball was my dream, it’s what got me, a kid from Longside, to see the whole of England and it was a big part of me,” Watson said. “However, I was really depressed when I was in New York playing basketball, my daughter was about to be born and I thought to myself, ‘I’ve got to make something happen.’ I said to my teammate at the time, ‘Two years, give me two years, I don’t care what happens, I don’t care if I’m in my senior year, if I don’t make it to the NFL in two years, I’m coming back to England,'” he added. Having set himself that goal he cut out many distractions and, two years later put in his draft grade and it was projected that he was going to go in the late second round. Okoye’s path was just as uncommon as Watson’s rise from the inner-city streets of Manchester. Okoye had just taken part in the 2012 Olympic Games in his home town of London where he finished 10th in the discus, aged 21, and he is still the British record holder in the discipline. It was in the aftermath of London 2012 that Okoye made the decision to switch to American football. “I was in Switzerland and I had just competed in a discus competition which I won. I was sitting with my agent and we were just talking and I said, ‘I’d like to play football man, I think I’d be good,’ and he was like, ‘yeah.’ It was literally that moment, he told me that he was going to take me out to Atlanta and that we were going to train and we’re going to do it. “I didn’t know it was going to happen, I was just talking but he kept on it and he booked me a flight to go out and start training on February 1st and I ended up going to the regional combine in Atlanta. Obviously I posted pretty good numbers and got invited to the Dallas super-regional and did well and got signed by the San Francisco 49ers,” Okoye said. Okoye now believes he is almost ready to make the next step from the 49ers practice squad onto their full roster with his positional coach for the last two years, Jim Tomsula being promoted to Head Coach. “I feel as though he’s one of the best coaches in the game and that I’ve learned so much from him. I think that I’m past the hardest part of my journey which was actually learning the sport and learning the rules. The 49ers have been great and I think that they believe in me, they kept hold of me when I really wasn’t good enough. Watson is further along in his NFL career. Unlike Okoye, he was not a complete novice in the sport when signed with the Oakland Raiders. Two seasons in college saw him touted as one of the brightest prospects in the 2013 NFL draft. After a season learning the nuances of the professional game he was promoted to be the Raiders’ starting right tackle for the 2014 season and he shared with the fans what drives him to succeed at the next level. And Watson still has ambition to motivate him – he wants to play in the Super Bowl, and to be in the Hall of Fame.